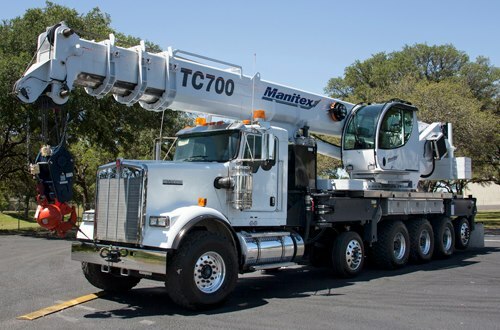 Manitex International, Inc. (Nasdaq: MNTX), a leading provider of engineered lifting solutions including boom truck and rough terrain cranes, rough terrain forklifts, special mission oriented vehicles, container handling equipment and specialized engineered trailers today announced the official launch of the Company’s highest-capacity crane to date, the Manitex TC700. This innovative new product marks the Company’s entry into the higher capacity global truck crane market with a lower cost product on a standard truck chassis. The launch is being held today at the Manitex 25th Anniversary Dealer Appreciation Event at the Company’s headquarters in Georgetown, Texas. Initial orders from several dealers have been received and deliveries are expected to commence in the second half of 2013.